I almost forgot! 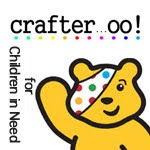 Make sure you go and have a nosy at the Crafteroo Folksy Shop for Children In Need - there's loads of wonderful treats from so many generous people at Crafteroo, all to raise money for this great charity. And my poppies are there too! All money from sales goes straight to the charity, nothing gets eaten up in fees or admin, so why not buy a little something for yourself to blast away the November blah?